Ronacrete are pleased to announce that RonaDeck Resin Bound Surfacing is guaranteed for 15 years from the date it is installed by a Ronacrete Approved Contractor. RonaDeck Resin Bound Surfacing is a blend of aggregates and resin which creates an attractive, porous (SUDs compliant) alternative to conventional paving or loose gravel paths. RonaDeck Resin Bound Surfacing has been used on footpaths at Westfield Shopping City, Twickenham Stadium and Jodrell Bank as well as providing driveways, paths and swimming pool surrounds at private residences nationwide. The 15 year guarantee covers general loss of stone, cracking, damage as a result of oil spillage or contamination, UV degradation, colour change and frost damage. 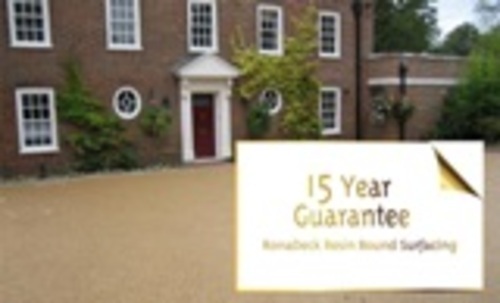 Get more information about the RonaDeck Resin Bound Surfacing 15 year guarantee. This press release was distributed by ResponseSource Press Release Wire on behalf of Ronacrete Ltd in the following categories: Manufacturing, Engineering & Energy, Construction & Property, for more information visit https://pressreleasewire.responsesource.com/about. For over 40 years Ronacrete has been at the leading edge of product development and performance. Innovation and brand leadership are enhanced by technical support which is considered the best in the industry.